Lisbon is one of Western Europe’s most beautiful capitals, and almost all of its attractions lie within a relatively small downtown area. As long as you don’t mind the hills, it’s a very strollable city, which lets you be more flexible about the neighborhood you choose to stay in. Whether you’re looking for boutique shopping, pumping nightlife, quality restaurants or a laid-back atmosphere, you can have it on your doorstep, yet still, never need to catch a cab or metro until it’s time to head back to the airport. These are the five best neighborhoods for visitors to Lisbon. 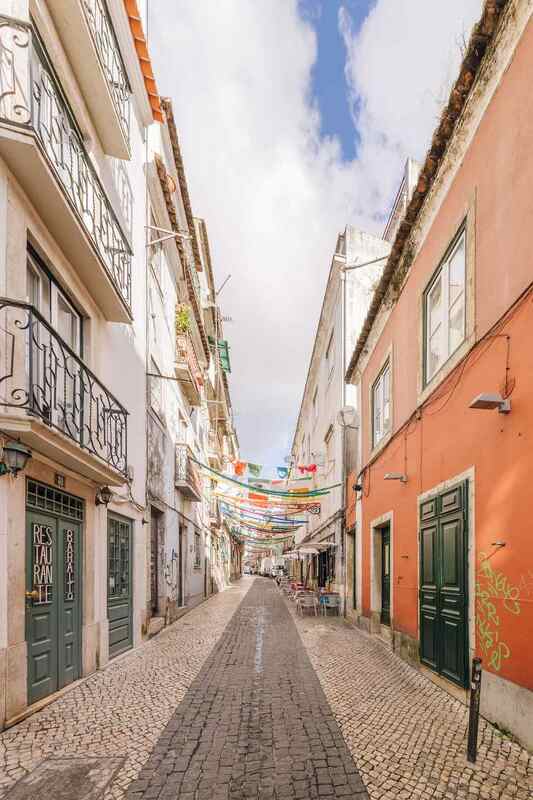 The oldest neighborhoods in the city, Alfama, and Graça are full of the narrow, winding streets that give central Lisbon much of its charm. Laundry hangs outside overhead windows, soulful fado music emerges from darkened bars, and life carries on for locals here much as it has done for decades. While the two neighborhoods seamlessly combine, Graça refers to the upper area around Lisbon’s famous castle, while Alfama tumbles down the hill towards the river. Both are atmospheric and fascinating in their own right, although you’ll get better water views near the top. It’s a good place to buy local crafts and sample traditional Portuguese dishes, and you’ll often smell sardines grilling long before you spot them. The roads are steep, even by Lisbon standards, so pack a good pair of walking shoes if you’re staying here. The maze of streets makes navigation difficult, but on the upside, also keeps most vehicles away. Parking spaces are almost non-existent, so don’t bother renting a car. If it’s shopping you’re after, look no further than the sophisticated Chiado neighborhood. It’s Lisbon’s answer to Fifth Avenue or Oxford Street, full of high-end local and international stores, and you could easily spend a day or two (and your entire trip budget) there. When you need to take a break from retail therapy, linger over an espresso and pastel de nata in one of the area’s luxurious cafes, or visit the oldest bookstore in the world. In the evening, take in a lengthy dinner and a show without leaving the neighborhood – Chiado houses some of the fanciest restaurants in the city, and is home to Lisbon’s theater district. Literally “Upper City”, Bairro Alto sits a little uphill of Chiado and is a popular spot for the late-night crowd enjoying Lisbon’s bustling nightlife. This means it can be noisy, especially on weekends. Rather than heading to bed early, this is the place to mix with the locals in one of the hundreds of nearby restaurants and bars. Less than a 10-minute walk from Bairro Alto, Príncipe Real has a noticeably different feel. Calmer and quieter, with more green space and a residential feel, it’s also home to many boutique stores, cafes, and restaurants. The city’s Botanic Gardens and Museum of Natural History and Science can also be found here. The heart of the neighborhood is Jardim do Príncipe Real, a small, tree-lined park with kiosks offering drinks and snacks to patrons at the outdoor tables. For a spectacular view over the city and river, head to Miradouro de São Pedro de Alcântara, which has a couple of permanent cafes and regular market stalls selling food, wine, souvenirs and more. Some of the city’s best restaurants can be found here, both on the main road and tucked away down several of the side streets. There’s easy access to two metro lines if you need them, but you probably won’t – it’s still just a 20 minute downhill walk to the river. For a more local, family atmosphere, head to Campo de Ourique. It’s a little further from downtown than the other neighborhoods and trades that proximity for green space and a lack of crowds. Here, you’ll find many top-quality bakeries and restaurants, offering Portuguese and international food at much better value than the tourist-oriented places closer to the water. For a smaller, more intimate version of the famous Time Out market, check out the Mercado de Campo de Ourique instead, or enjoy a beer or light meal at the kiosk in Jardim Teófilo Braga, the small park at the heart of the neighborhood. It’s hard to miss the Basílica da Estrela, an ornate 18th-century church on the edge of the Jardim da Estrela. In summer, make like the locals, pack a picnic and sunbathe on the inviting grass of this large park.